Sri Lanka Customs Department is speeding up its cargo clearance procedures by improving the country’s risk management system. The Asian Development Bank is giving technical assistance to Sri Lanka to study the country’s current risk management system and come up with a risk management framework and standard operating procedures. A team of technical experts from Nepal undertook an official visit to India to (i) study India’s inland waterway infrastructures in consideration of Nepal's needs, and (ii) hold discussions with their counterparts in India. This field visit follows the meeting between Indian and Nepalese government officials held in July 2018 in Kathmandu, Nepal. The Eminent Persons' Group on Nepal-India relations has finalized its report, with recommendations on updating bilateral treaties and agreements between India and Nepal, in line with the present reality of the two countries. The recommendations concern trade, commerce, water resource, people-to-people contact and cultural ties. The joint report, prepared in consensus by representatives of the two nations, lays a strong groundwork for furthering India-Nepal relations. Member nations of SAARC have agreed on common standards for biscuits, refined sugar, and milk products. The South Asian Regional Standards Organization (SARSO) has set regulatory standards for these three products, including requirements related to packaging, marking, labeling, and sampling of biscuits and refined sugar, as well as production, processing, and handling of milk and milk products. The Federation of Indian Chambers of Commerce and Industry is fast-tracking implementation of the United Nations TIR Convention, following the Indian government’s initiatives to promote trade expansion, particularly along the international North-South Transport Corridor. The Bhutan Standards Bureau (BSB) hosted the first National Standards Conclave in Thimphu to highlight the importance of standardization among different stakeholders. The Conclave aimed to help chart the direction and objectives of standard setting in the country. The absence of national standards hinders Bhutan from being a party to a regional standards body such as the South Asian Regional Standards Organization (SARSO), and other standards organization. The National Export Strategy (NES) of the Government of Sri Lanka has been finalized by the Export Development Board (EDB) and is ready for submission to the Cabinet. The strategy aims to boost the performance of the country's focus sectors and improve the business environment by developing trade support functions in logistics, trade information and promotion, and national quality infrastructure. Mr. Pradeep Kumar Gyawali, Minister of Foreign Affairs, Government of Nepal, and Mr. Wang Yi, State Councilor and Minister of Foreign Affairs, People’s Republic of China (PRC), held official bilateral talks during Mr. Gyawali’s official visit to PRC. The Meeting discussed speedy implementation of all agreements and understandings, and establishment of a coordination and implementation mechanism to assist in the effective implementation of PRC-supported projects in Nepal. The BIMSTEC conference, "BIMSTEC at its 20: Towards a Bay of Bengal Community" convened scholars, think-tanks, government officials, diplomats, business leaders, and other stakeholders from BIMSTEC member countries—Bangladesh, Bhutan, India, Myanmar, Nepal, Sri Lanka, and Thailand—to take stock of the inter-regional organization's achievements and milestones, and aimed to chart a new direction for the future. It examined the potential and challenges of the BIMSTEC region. The Cabinet of Nepal has approved the modality of the Electronic Cargo Tracking System (ECTS). Following this, Nepal's Ministry of Commerce (MoC) has begun preparations for ECTS implementation with the assistance of ADB. Mr. Ravi Shanker Sainju, Joint Secretary, MoC, is hopeful that the ECTS will help control the turnaround time of shipping line containers, and significantly reduce the delay and cost of trade. He stressed that if Nepal can minimize time consumed in trade, cost of goods. India's Central Board of Excise and Customs (CBEC) piloted paperless processing of documents in Chennai and New Delhi to promote the ease of doing business. CBEC's newest facility enables digitally signed supporting documents to be uploaded to further reduce clearance time. The Asian Development Bank has approved a $21 million loan to support the Government of Nepal’s efforts to simplify, harmonize, and modernize the country’s trade processes, under the South Asia Subregional Economic Cooperation. The program will help the country to promote and diversify exports, and help it fulfill its commitments to international customs standards. Sri Lanka Prime Minister Ranil Wickremesinghe visited India on 25-29 April 2017, for discussion with India Prime Minister Narendra Modi on a range of bilateral issues and matters of mutual interest. Prime Minister Wickremesinghe welcomed the signing of the MoU for Cooperation in Economic Projects, which outlines the agenda for bilateral economic cooperation. Amidst the rising debate against trade and globalization, World Trade Organization Director-General Roberto Azevêdo argues against increasing protectionism and emphasizes how trade has proven its worth in development benefits. He remarks how trade can become more inclusive, with gains shared across society. Indian business leaders met with World Trade Organization (WTO) Director General Roberto Azevêdo to discuss the future of the global trading system. The roundtable meeting, hosted by the International Chamber of Commerce and attended by over 50 senior representatives from various sectors, focused on trade reforms to strengthen inclusive growth and other world trade developments. The Second India-Bhutan Joint Working Group on Customs highlighted the possibility of facilitating bilateral trade in select land Customs stations along Bhutan-India borders; and discussed streamlining Customs procedures and document requirements at entry and exit points. It also agreed to open three more trading points between Bhutan and India, and discussed issues including development of Goods and Service Tax in India. A conference held by the Sri Lanka Press Institute highlighted how enabling paperless trade will improve Sri Lanka's business competitiveness, and help the country achieve its ambition of becoming a regional logistics hub by enhancing its international trade processes. Mr. Romi Gauchan Thakali, Minister for Commerce, Nepal, emphasized the need to finalize and implement the Bay of Bengal Initiative for Multi-Sectoral Technical and Economic Cooperation (BIMSTEC) Free Trade Area (FTA) Framework Agreement, to help boost growth among least developed and developing nations in South and Southeast Asia. He also highlighted implementation of the BIMSTEC Transport Infrastructure and Logistics Study. The Bhutan-Thailand Joint Trade Commission held its first meeting on 24-25 August 2016 in Thimphu, Bhutan, to discuss ways to increase bilateral trade and improve economic cooperation. Ms. Apiradi Tantrapon, Minister for Commerce, Thailand, emphasized that implementing the 2013 bilateral trade and economic cooperation agreement is key to strengthening economic relations. Ongoing negotiations for the proposed Sri Lanka-India Economic and Technology Cooperation Agreement (ETCA) are addressing many of the existing procedural barriers and delays Sri Lankan exporters face in Indian ports of entry. In this speech, Mr. Malik Samarawickrama, Sri Lanka Minister of Development Strategies and International Trade, discusses measures included in the Government's economic reform agenda, including ETCA. The Government of India is taking steps to boost the country’s exports by promoting access to new products, and expanding market access initiatives and market development schemes. India is promoting product standards, providing a facility for duty-free import of machinery for production of goods for export, and helping in the packaging and branding of Indian-made products. The Indian Prime Minister is prioritizing stronger relations with South Asian Association for Regional Cooperation (SAARC) member countries. Deputy High Commissioner of India JP Singh said that Indian Prime Minister Narendra Modi is taking steps to improve trade relations with SAARC member states, citing the liberalization of India’s visa regime for the business community. The Governments of India and Sri Lanka have agreed to fast-track negotiations on the proposed Economic and Technology Cooperation Agreement, with the aim of concluding talks by end 2016. A meeting between Indian and Sri Lankan officials is set in August 2016, where discussions may include removal of technical barriers to trade hampering Sri Lankan exports to India. India's Central Board of Excise and Customs is working to fast-track cargo clearance to hours, instead of days, through implementation of a paperless system for cargo clearance. The Government of India aims to fully digitize Customs clearance, replacing physical documentation, by 2017. The BBIN Motor Vehicle Agreement (MVA) is making it easier for passengers and freight vehicles in Bangladesh, Bhutan, India, and Nepal to travel around the region. BBIN finalized the MVA in an effort to facilitate cross-border trade and travel in South Asia. A BBIN Business Forum sees energy and water cooperation playing a vital role in taking integration even further in the region. Sri Lanka needs to immediately put in place a comprehensive system of trade agreements, says Mr. Malik Samarawickram, Sri Lanka Minister for International Trade. In a business forum in Singapore, Mr. Samarawickram highlighted Sri Lanka's efforts to remove certain tariffs and to modernize its Customs system through ASYCUDA and the one-stop shop at the Central Customs Clearance Unit. The 7th Session of the Second Parliament of Bhutan passed the new Customs Bill on 7 June 2016. The Bill was drafted according to standards of the Revised Kyoto Convention, and aims to simplify and harmonize Customs procedures in the country and introduce international best practices in Customs. It aims to promote external trade, including trade with countries in the SAARC region, and bring increased revenue through risk management and automation. The South Asian Association for Regional Cooperation Development Fund (SAARC SDF) and the Asian Development Bank (ADB) have signed a memorandum of understanding to undertake development projects in the South Asian region. A strong business agenda in services trade could improve opportunities in South Asia, increasing the level of prosperity and economic development in the region, emphasized India Commerce Secretary Rita Teaotia as she called for South Asian countries to work together to push services exports. India's Minister for Road Transport and Highways and Shipping Nitin Gadkari announced the Government's updated target to complete the Sagar Mala program in 5 years at the Maritime India Summit. The project will help reduce logistics costs, boost merchandise exports by $110 million, and create 10 million new jobs. A delegation from Bhutan's Royal Institute for Governance and Strategic Studies participated in an interactive session with representatives from the Indian Institute of Entrepreneurship and Federation of Indian Chamber of Commerce. The Meeting discussed possible cooperation between Bhutan and India's North East in sectors including trade, commerce, hydropower, and tourism. Sri Lanka Customs launched its Single Window System, paving the way for smoother and more efficient cross-border trade transactions. According to Sri Lanka Customs Director General Chulananda Perera, the Single Window benefits traders by lessening delays and cutting down on cumbersome procedures. Mr. Dinesh De Silva, Chairman, Import Section, Ceylon Chamber of Commerce sees the Single Window System driving down costs for businesses. The 4th India-Sri Lanka Commerce Secretary meeting agreed to include the signing of a Mutual Recognition Agreement (MRA) on Standards in the agenda of an upcoming meeting in February 2016. This MRA aims to boost Sri Lankan exports to India by automatically allowing products certified by the Sri Lanka Standards Institution to enter India. A study by Verite Research found that non-recognition of Sri Lanka's standards certificates in India affects growth of Sri Lankan exports in India. The World Trade Organization (WTO) 10th Ministerial Conference agreed on a series of trade initiatives and decisions to benefit its least developed country (LDC) members, including re-affirmation of public stockholding for food security purposes; preferential rules of origin which calls on preference-granting members to simplify documentary and procedural requirements related to origin; and 15-year extension of preferential treatment for LDCs in the area of services to increase LDC capacity. Accession to the World Trade Organization (WTO) was discussed during a workshop on Bhutan's graduation from least developed country (LDC) status, held on 17-18 November 2015. The Workshop clarified how membership to the WTO will benefit Bhutan, including enjoying the benefits of a multilateral trading system with WTO member countries, and discussed wider implications of WTO membership. The SAARC Chamber of Commerce and Industry (SAARC-CCI) has developed a comprehensive mechanism to resolve SAARC trade disputes amicably through the SAARC Arbitration Council (SARCO). SARCO offers a fair mechanism, and guarantees thorough inquiry in the pursuit of legal solutions to conflicts. Indian Commerce Minister Nirmala Sitharaman encouraged economies in the region to speedily work toward a free trade area with a defined timeline, preferably 2020, to achieve the joint vision of a South Asian Economic Union. Speaking at the South Asia Economic Conclave, she further highlighted that India is committed to total trade liberalization, and is working to ensure that its South Asian neighbors will be able to export to India on zero tariff. Regional cooperation and integration can help improve cross-border connectivity, increase regional trade and investment, mobilize regional savings for regional investment, reduce macroeconomic vulnerability to shocks, facilitate cooperation in regional public goods, and improve the overall governance standards across the region. A commentary on regional integration in South Asia is shared. Sri Lanka Prime Minister Ranil Wickremesinghe has extended an invitation for Indian Prime Minister Narendra Modi to visit Sri Lanka in May or June 2016 to sign an agreement on economic and technological cooperation. The two Prime Ministers held discussions on enhancing economic ties between India and Sri Lanka and resuming ferry services during Prime Minister Wickremesinghe's visit to New Delhi, India on 14-16 September 2015. Bhutan and Nepal conducted an international trade fair from 4-8 September 2015 in Thimphu, Bhutan to boost trade between the two countries. This private sector event recognizes Bhutan as a potential market for a growing number of businesses. A total of 215 business entities from seven countries participated in the fair. Data from the World Trade Organization's (WTO) latest monitoring report reveal 104 new trade restrictions were adopted by WTO members from mid-October 2014 to mid-May 2015, an increase of 12% since the last reporting period. WTO Director General Roberto Azevêdo said the organization should seek to make decisive progress in eliminating remaining trade-restrictive measures. Integration indicators in the South Asia Subregional Economic Cooperation (SASEC) subregion have been updated to include 2014 data, based on calculations by the Asian Development Bank’s Asia Regional Integration Center. 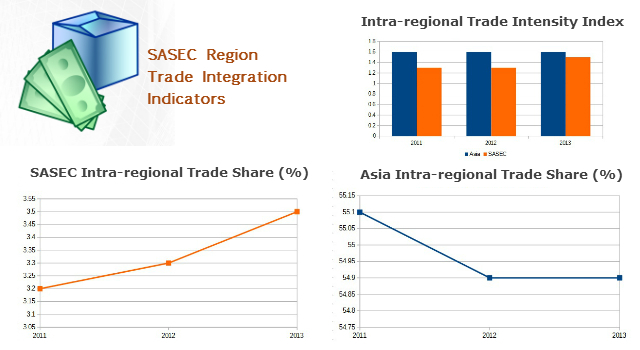 SASEC trade integration has continued to increase over 2012-2014, as shown by its Intra-regional Trade Intensity Index. The Government of India has cleared utilization of India's capital contribution to the SAARC Development Fund (SDF) for its Infrastructure and Economic Windows, to address infrastructure bottlenecks and promote growth in the SAARC region. This approval will help boost projects that will increase intra-SAARC trade and maximize the region's growth potential. The State Government of Andhra Pradesh and the Asian Development Bank reviewed the inception report for the Regional Perspective Plan of the Vizag-Chennai Industrial Corridor (VCIC), India’s first coastal corridor on 29 May in Hyderabad, India. Industrial analysis, infrastructure development and business regulatory reform proposals were presented. A Memorandum of Understanding was signed between the presidents of the Bhutan Chamber of Commerce and Industry and Bengal Chamber of Commerce and Industry on 13 May 2015, stating that both chambers would assist the enterprises of the other country to invest jointly in their respective countries. A Bilateral Committee is to prepare a new draft framework between India and Sri Lanka and bring life back to stalled negotiations related to the Comprehensive Economic Partnership Agreement (CEPA). CEPA aims to deepen the existing FTA between India and Sri Lanka, including in the areas of services and investments. In order to achieve the CEPA objective, it is recommended that representatives from relevant trade chambers – National Chamber of Exporters and Department of Commerce – be included. The fourth Nepal International Trade Fair, held 12-16 March 2015 in Kathmandu, Nepal, highlighted Nepal's 19 priority export products identified by the Nepal Trade Integration Strategy. Business enterprises from other SAARC countries—Bangladesh, Bhutan, India, and Pakistan—also joined. A total of 340 stalls exhibited different goods for 5 days, drawing 125,000 visitors, and recorded sales worth over $1.9 million. Prime Minister of India Narendra Modi visited Sri Lanka on 13-14 March 2015, and signed four agreements with recently-elected Sri Lanka President Maithripala Sirisena, including a Customs Cooperation Agreement that aims to balance the trade deficit between the two countries. 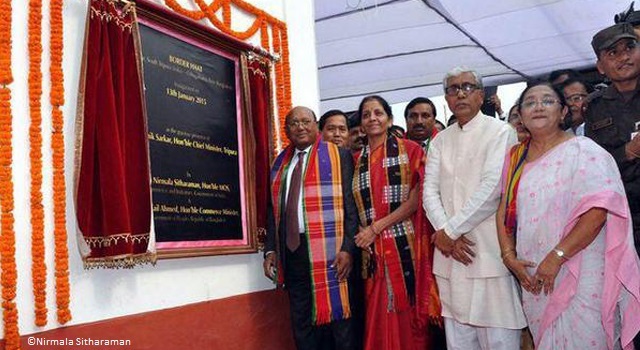 He is the first Indian prime minister to visit the country in 28 years. The South Asian Association for Regional Cooperation Chamber of Commerce and Industry (SAARC CCI) plans to form subregional blocs that will address common economic issues of its member countries to increase intra-regional trade. This was proposed under the SAARC CCI Action Plan for 2015, tabled during a joint session of SAARC CCI's 62nd Executive Committee and 20th General Assembly in New Delhi, India on 10 March 2015. Mr. Saurabh Kaushik, research intern for the Institute for Peace and Conflict Studies, examines the trend toward subregional cooperation in South Asia. He traces the reasons for lack of significant outcomes of subregional groupings in the region, and discusses the “silver linings” on the horizon, including projects being supported by the Asian Development Bank (ADB) under the SASEC program. India plans to reduce the number of sensitive items subject to import duty under the South Asia Free Trade Agreement (SAFTA) for Pakistan and Sri Lanka. It has already decreased the number of sensitive list items for least developed countries (LDCs) of the South Asian Association for Regional Cooperation (SAARC) region. According to A.M. Gondane, Joint Secretary, SAARC, this will have Customs revenue implications for both countries. The Power Trade Agreement (PTA) and the Power Development Agreements (PDAs) are recent developments that have renewed optimism in an India-Nepal economic cooperation. The PTA is expected to encourage international investment in Nepal’s hydropower sector while the two PDAs are expected to boost investor confidence in Nepal’s water resources. The Validation Forum on Gender Dimensions of Regional Cooperation and Integration in South Asia, held on 28-29 October in ADB Headquarters, took stock of progress made in mainstreaming gender in multi-, regional, bilateral and country policies and legal frameworks. Finance Ministers and representatives from 49 Asia-Europe Meeting (ASEM) Member Countries and the European Commission attended the ASEM Finance Ministers’ Meeting in Milan, Italy on 12 September 2014. The Ministers renewed their commitment to increased inter-regional investment and trade flows, protectionism resistance, and a successful conclusion to the World Trade Organization Doha Round. The Asian Development Bank approved just over $50 million for Bhutan’s South Asia Subregional Economic Cooperation Road Connectivity Project on 31 July 2014. The project will increase Bhutan's trade competitiveness by improving cross-border movement of people, goods, and business through construction and upgrading of the national highway network, and creating essential trade and trade facilitation infrastructure. The Asian Economic Integration Monitor (AEIM), a semiannual review of regional economic cooperation and integration in Asia covers regional economic updates, intraregional trade, financial integration and investment, and the importance of disaster risk financing instruments. The Theme Chapter: Insuring Against Asia’s Natural Catastrophes discusses market solutions and the role of government in developing disaster risk financing and strengthening financial resilience. The Asian Development Outlook, ADB’s flagship economic publication provides comprehensive macroeconomic analysis in Asia including growth projections by country and region. The Asian Development Outlook 2014 forecasts that developing Asia will grow 6.2% in 2014 and 6.4% in 2015. The Third Bay of Bengal Initiative for Multisectoral Technical and Economic Cooperation (BIMSTEC) Summit of Leaders and related events was held on 1-4 March 2014 in Nay Pyi Taw, Myanmar. Member States – Bangladesh, Bhutan, India, Myanmar, Nepal, Thailand, and Sri Lanka – strengthened their resolve to jointly promote rapid economic development, and accelerate social progress in the sub-region. Issues resolved surrounding trade grievances mutual recognition and customs agreements are expected to facilitate bilateral trade between the two countries.